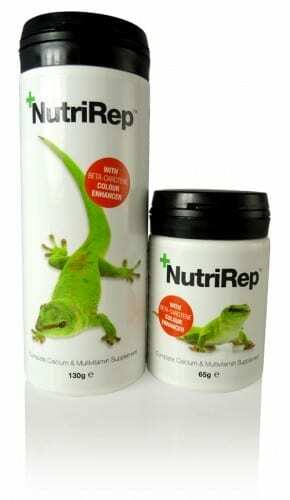 NutriRep™ is a complete calcium, vitamin & mineral balancing supplement for reptiles with added D3. It can be dusted onto all food sources including Insects, Meats & Vegetables. No other supplement is required. The unique formulation includes colour enhancing Beta-Carotene through natural Spinach & Carrot powder. Fed to your reptiles over a period of time, Beta-Carotene can help enhance your reptiles optimum colours. Instructions for use: Sprinkle a small amount over the foods, ensuring a fine coating is applied. All reptiles require slightly different supplementation; seek veterinary advice for specific care. Nutritional Additives: Calcium 205g per Kg, Vitamin D3 150,000 IU/KG, plus Vitamin A, C, E B1, B2, B6, B12, Nicotinic & Pantophenic Acids, Folic, Biotin, Choline Chloride, Minerals, FE, CO, MN, CU, ZN, I, SE.